Dad asked me to smile for a picture and this is what I gave him. Then he got this picture of me deep in thought. I started a football clinic. Here are some photos of me doing a receiving drill. Today, I had OREOs. As you can see,I enjoyed them. Today, I started my basketball clinic. Here are some photos from the session. Today, I wore a shirt with a puppy on it. If you asked me where my puppy was, I would point to my shirt and laugh. Tonight, we had our first football game - the Lions (us) against the Bears (them). Unlike the real Lions vs. Bears game, we won! I was all dressed up and ready to go for the Michigan game today, only I was wearing pink instead of blue. I was even in my Michigan gear before Daddy. It was the first day of school today. Here are some pictures from the day. I am proud as a peacock when I sit on the couch with my brothers, even though neither of them could look away from the TV. 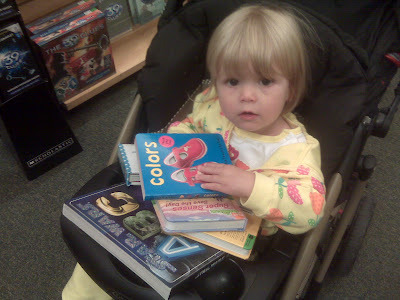 Last night, we went to the bookstore. I plucked a lot of books off the shelf and when it came time to decide what we were getting and check out, I wasn't giving up any of them.